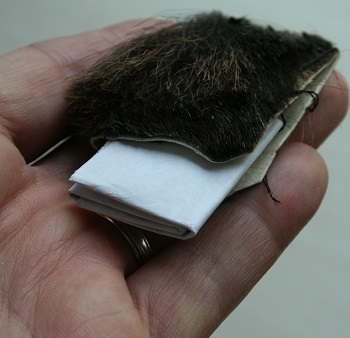 Magic paper inclosed within a deer skin. We’ve written a number of articles about amulets (jimat) that are in common use in Indonesia. Recently we wrote about the Haikal Kulit Kijang, or “Empowered Deer Skin.” After talking with an Indonesian acquaintance of ours about that deer skin, he told us that people should be extremely cautious about becoming involved with these objects, because these amulets may bring curses, instead of protection and good luck. This is his story…. This shows the paper with the Arabic writing which is believed to be empowered by spirits. From what we were told, the shaman / witch doctor (dukun; orang pintar; orang pandai) that prepared and gave the boy that necklace must have made a deal with the evil spirits. It’s assumed that this shaman would occasionally be required to place a curse on people, and sacrifice someone from time to time, so his spiritual powers would continual to work. 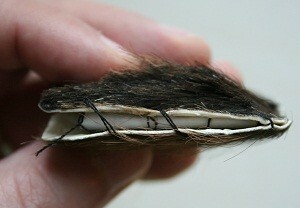 This object is is a small piece of skin (2″ x 4″) which is said to be from a type of deer common to Indonesia (kijang). This is a nail amulet which is the first nail to be used when building a new home, or a new construction of any sort. 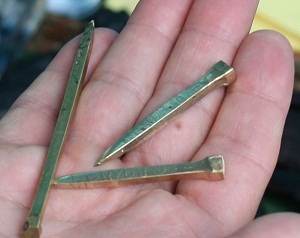 Indonesians often begin construction of their homes with a nail that is believed to be an amulet (jimat). These nails are the first to be used when building a new home or any other type of construction. It’s believed that these nails will protect homes from fires, thieves, earthquakes, and anything imaginable. After being purchased, the nails are taken to a shaman / witch doctors (dukun, orang pintar, orang pandai) who will perform a ritual, empowering them with magic.